The borders between the Baltic States and Russia / Belarus. The border between Lithuania and Belarus. The border between Poland and Russia. The border between Estonia and Russia. A report of my Baltic Border Tour 2015. Bordermarkers near Selsininkai and Medininkai. Fences, cameras and Border Guards. Bordermarkers between Poland and the Russian exclave Kaliningrad. 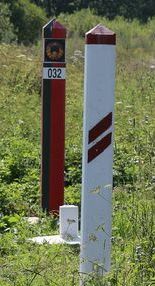 The bordermarkers between Estonia and Russia.